Stop feeling bloated, gassy and uncomfortable! Find out what you need to be eating so you can start feeling in better in just a week! Feel happier and more comfortable! Love your belly and enjoy food again! Are you dealing with headaches, constipation, joint pain, anxiety, PMS, hormone issues, depression and a constant lack of energy? Are you tired of feeling gas, bloating and generally uncomfortable when you eat? Would you rather feel nourished, energized and ready to live your life? 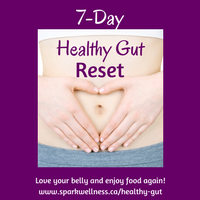 7 day of menu plans, shopping list and support to reset your digestive system!